The original EMS field guide has grown into the most used reference guide in EMS history. 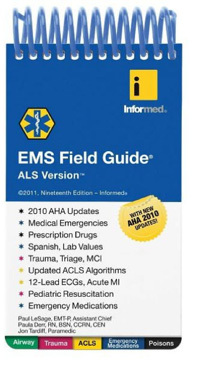 This is the guide that EMS Magazine calls “The original and still the best.” The Nineteenth Edition EMS Field Guide, ALS version has been updated with the new 2010 CPR and ACLS algorithms from the AHA. This handy guide makes it easy for paramedics, nurses and physicians to look up their patients’ medications, check drug doses, quickly interpret 12-Lead EKGs and much more!